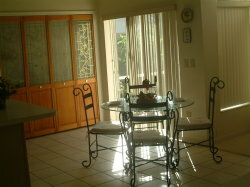 This well maintained family home sleeps up to 8 people and offers 3 good size bedrooms. The master bedroom has a Kings size bed and a large en suite bathroom with both bath and shower. You will find a Hair Drier here so no need to pack one! The comfortable lounge/diner has amongst it a Sofa Bed that sleeps two adults adequately. 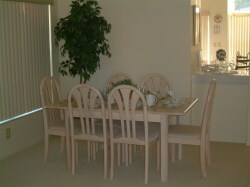 The large dining table seats 6 people. A further table,seating four people can be found in the kitchen area. The kitchen is well equipped consisting of a Fridge/Freezer, Cooker, Microwave,Plates Glasses and Cutlery,Iron and Ironing Board. The home also houses a Washing Machine and Tumble Drier. 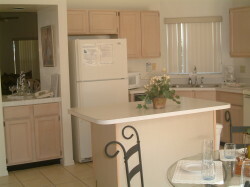 All rooms have cable television,air conditioning or ceiling fans at no extra cost. The house has a large private screened pool and deck area, which for the sun enthusiasts gets the rays all day long, you will find sun loungers, table and chairs for your convenience.The house is close to all amenities ie Theme Parks, Restaurants, Bars, Shops,Golf. 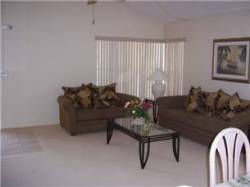 It is available for rental all year round and would suit a family looking to explore all that Orlando has to offer.